Curator Kim Knoppers interviewed each of the participating artists in Foam's current exhibition, Alumni of the Rijksakademie. Here, she talks to Alexandra Leykauf about her work in the show. How does a series like Spots emerge? Spots is different from a series like for example Chateau de Bagatelle in that it is actually one piece that comes in several parts. I wanted to describe an entirely dark room only by the way in which light intersects with its invisible confinements. There was only one spot - one light cone - per negative. I sandwiched the negatives in the dark room to create an image in which several rays of light cross each other. Developing the images myself in the darkroom was an obvious choice for such a motive. In the case of Spots the possible combinations of negatives are statistical. All parts together would add up to an entirely white room, which would therefore be just as invisible. Spanische Wand is especially adapted to the exhibition space in which it is on show. Why is this important and what do we actually see when looking at Spanische Wand? Spanische Wand confronts the process of image making with the physical experience of an architectural space. 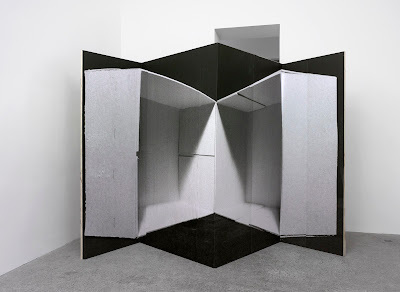 A cardboard box built to the same proportions as the exhibition space, on other words, the simplest model possible of the exhibition space, was split into two halves and opened up towards the camera. The resulting image was then printed in large format and mounted onto a wooden room divider in such a way that its perspective foreshortening contradicts the actual architecture of the wooden construction. A classic trompe-l'oeil effect that comes into being and that falls apart depending on the viewer's position. Spanische Wand constitutes a passage from a three-dimensional object to the surface of the image back to a spatial experience. I would describe this experience as one of looking at from within, as a simultaneous experience of distance and immersion. Because the cardboard box is a model of the exhibition space the viewer finds himself being part of a mise-en-scène. In most of my works I change the scale of architecture through its own reproduction. It is this change of scale that gives me and the viewer the freedom to relate to the work in question in an imaginary as well as in a physical way. What do you consider to be the most important themes in your work? I am trying to find and provide a point of view towards the contradictory truths of the image. Be it the photographic image, the film image, the image created on a theatre-stage or the formal layout of a baroque garden, my work is driven by the wish to transcend the surface. The questioning of given perspectives is a recurring theme in all my works; most literally as an engagement with the architecture of the exhibition space, as a juxtaposition of the vanishing point in a Renaissance painting, the movie-projector as the vantage point of the film image, or as a contemporary condition when confronted with the evasive period of time captured on an old photograph. I try to gain a sense of orientation, not to detach myself form the image, but to disrupt reality itself. Why are theatre and early photography so important to you? Has it got something to do with the experimental character, with something that can be developed further? I am attracted to theatre, because it is a magnifying glass for the politics of image making and a condensed form of reality against which many of the questions I ask myself can be pinpointed. Where am I exactly in relation to what is being enacted? Can I get a glimpse behind the scenes or am I stuck in my seat in the auditorium? How does my perspective change if I leave my seat? Any kind of staging produces an ideal viewing point and thus always engenders an »off«. This is not only an invisible area outside of the constructed reality of the respective image, but also a place with different properties. It is this »off« or »beyond« that I am searching for. The concept of a place behind the scenes or outside of the confinements of the visible is also one that touches upon the question whether there can be an element in any image that enables a direct experience, an immediate view. Believing that perception is based on recognition, I use found photographs as a bridge from what I assume to be part of a collective memory to my individual take and matter of concern. It is my concern to contrast what can be identified and placed in a certain context with a moment of orientation lost. I believe that the uncertainty such a moment evokes, is connected to a sense of presence and forms a liberation from given circumstances.